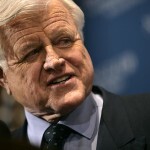 We at Luxury Residential Group pay our tributes to Massachusetts Senator Edward Kennedy(1932-2009) who has helped shape the United States History and Future. Whether you agree or dissagree with his views, you cannot dispute the fact that he has had a great impact on making our great country what it is today. This entry was posted on Thursday, August 27th, 2009 at 10:05 am	and is filed under News. You can follow any responses to this entry through the RSS 2.0 feed. You can leave a response, or trackback from your own site.